After Labor Day, the race for the White House will shift into high gear. Aside from the brief bump post-GOP convention, Trump has consistently lagged Clinton in the polls. However, it’s still too early for Hillary to begin picking out her drapes for the White House. According to a recent CNN Poll of Polls, the race is back to its pre-convention levels. Clinton holds an average of 42% support to Trump's 37% across five nationwide polls. No matter who wins in November, one thing is sure — the next two months promises to be filled with unprecedented drama – like no other presidential election. In the end, elections come down to the economy — jobs, wages, and trade. In this respect, the differences between the two presidential candidates are significant. With that stated, it’s important for investors to understand global economic and market implications under two very different presidencies. Markets prefer certainty over uncertainty — who doesn’t. For the most part, the markets suspect they know what they are getting with a Clinton presidency and should react less negatively to a Clinton victory. About 40 percent of the S & P 500 companies generate about 40 percent of their revenues from global trade, and it should be business as usual under a Clinton presidency. Unlike Clinton, Trump promises to renegotiate our trade agreements because he believes they are simply “terrible.” The author of the “Art of the Deal” will use his deal making skills to renegotiate trade deals that are "fair." His protectionist rhetoric could make for profound instability in global markets. In fact, markets are scared to death of Trump’s unpredictable patterns of behavior. Under a Clinton administration, financial service companies will be hit with even more regulation. Hillary is also a big supporter of the Consumer Financial Protection Bureau promulgated by her close ally, Elizabeth Warren. New rules will increase costs for the financial companies, yet paradoxically, the financial sector is rising in the belief that a Clinton presidency will be better for the economy. Again, markets prefer certainty. On the other hand, Trump plans to roll back Dodd-Frank and eliminate the Consumer Financial Protection Bureau. Similar to Bernie Sanders, he promises to bring back an updated version of the Glass-Steagall Act (which should never have been repealed in 1999). The Glass–Steagall Act describes four provisions of the U.S. Banking Act of 1933 that limited securities, activities, and affiliations within commercial banks and securities firms. In theory, this should be better for the economy as it unleashes growth and profits for the smaller regional/community banks and reigns in Wall Street and big government spending. The healthcare sector will be facing a very different set of pressures from the two administrations. Clinton will be tough on the pharmaceutical and biotech sector. However, she will be positive for managed care stocks. Trump promises to repeal the Affordable Care Act known as Obamacare, a negative for managed care names. He is a positive for big pharma/biotech by his promise of less regulation. He also vows to open state health insurance markets to more competition by eliminating "the lines around states." No matter who wins the presidential race, the energy industry is plagued with an oversupply of both oil and natural gas. Countries are producing more oil than current demand, thanks to technology, putting downward pressure on prices. When it comes to this sector of the market, government policy is very different for the two nominees. Clinton will continue to promote alternative, “green energy” and discourage fossil fuels, particularly coal. Trump, however, will promote the XL pipeline, and support fossil fuels, such as coal. His populist rhetoric could strengthen the dollar, leading to lower energy and commodity prices. Industrial stocks levered to infrastructure projects should fare well under both Clinton and Trump. Interestingly, industrial stocks rallied earlier this year due to Clinton's aggressive infrastructure spending plan. Hillary Clinton has proposed $275 billion in direct spending on infrastructure over five years. (click here). That’s not nearly enough, according to Trump, but at least she has a plan. Trump is crafty and has yet to lay out a clear plan for his ambitious infrastructure agenda, a hallmark theme of his campaign. If Trump wins, congressional Republicans will most likely still control the House and can try to rein in his spending plans. As we have stated in past posts, business spending is lackluster. In fact, if you delve deeper into the numbers, you’ll discover a business recession. And the Fed can’t fix it. Profits, business investment, and ISM manufacturing are all down. Help businesses get out of a recession with tax reform is one possible answer. Secretary Clinton has yet to announce a corporate tax plan. However, she has stated that she wants to raise taxes across-the-board on individuals, businesses, and investors. At the risk of sounding partisan, raising taxes and regulations on businesses is not a formula for getting out of a business recession. She has proposed a “fair share surcharge” on the rich to ensure the wealthiest are not able to pay lower tax rates. Click here for Hillary Clinton's tax reform plan. Trump, on the other hand, wants to cut the corporate tax rate from 35 to15 percent, reduce regulatory burdens, and enact a smart repatriation plan to bring a few trillion dollars in corporate cash back to America. He also wants to eliminate the corporate alternative minimum tax. Click here for Trump’s tax reform plan. How will your investment portfolio perform under new American leadership? What changes in strategy are prudent? Besides election uncertainty, high market valuations and punk earnings growth make us cautious. The market is anticipating a Clinton win. A Trump victory would surprise markets, particularly as risk-parity trading algorithms used by the largest hedge funds and many money managers, are caught wrong-footed. Subsequently, volatility would pick up and we could experience a market correction of 5 -10 percent as risk markets adjust. Remember how markets reacted after Brexit? However, markets could get an eventual lift from a Trump victory as animal spirits get aroused because of his proposed tax and regulatory reforms. This October could prove to be a particularly volatile month with game-changing global events converging — Brexit negotiations and the widely anticipated WikiLeaks Clinton email dump, just to name a few. At this juncture, given our cautious position towards risk assets, we are holding higher levels of cash relative to our benchmark model allocations. A well-balanced portfolio should perform well under either candidate and weather volatile markets. And in a growth-starved world, a disciplined asset allocation strategy will be a key determinant of your portfolio returns. Sources: The Wall Street Journal Online; Bloomberg News; Forbes.com; The Economist.com; CNBC News; CNN.com; Reuters News. 1. Glass-Steagall Legislation from Wikipedia, the free encyclopedia. 2. Fact Set Earnings Insight, August 29, 2016. On Friday, July 29th, the Commerce Department reported that the economy grew at a meager annual rate of only 1.2 percent for the second quarter, compared with Wall Street estimates of 2.6 percent -- a big miss. GDP growth also was revised down to 0.8 percent from 1.1 percent estimate for the first quarter. The one bright spot in the second quarter was consumer spending, but the consumer can’t drive growth single-handedly. Business investment went into negative territory for the second quarter, reflecting higher uncertainty about the economic and political outlook. Until they have a better sense of the regulatory environment post-election, CEOs will be conservative with their balance sheets and hold off on investing new capital. The current economic recovery that began in March 2009 is the weakest since World War II. Stock Market Valuation: the forward 12-month P/E ratio is 17.0, above the 5-year and 10-year averages and median of 14.63. This P/E ratio is based on Thursdays closing price of 2170.06, and the forward 12-month EPS estimate is $127.93. Earnings came in at $120 in 2015. The Dollar/Yen & Treasuries: the headwind of a stronger dollar in 2015 is now a tailwind for earnings. My mother traveled to Japan a year ago and $1= 123 yen…today, $1=101 yen. The 10-year treasury yield then was about 2.20 percent...today, 1.54 percent. Both are considered safe-haven asset classes and signs of risk aversion by global investors. Another harsh reality: as of June 2, 2016, the national debt is a whopping $19.2 trillion, nearly double what it was prior to the Obama presidency. justfacts.com/nationaldebt.asp. 105% of the U.S. gross domestic product. 51% of annual federal revenues. In CWM's "Is this the end of our Goldilocks economy", we cited that: "according to a Congressional Budget Office (CBO) report released in January of this year, once the Fed begins raising rates, the 10-year Treasury note will begin rebounding to its historic norm and reach 4.6% by 2025. This return to normalization will raise our national debt payments from $227 billion a year in 2015 (1.3% of GDP) to over $820 billion by 2025 (3.0% of GDP, the highest ratio since 1996). Future costs of servicing our national debt due to higher interest rates could present a real drag on GDP." After watching both the Republican and Democratic conventions, I didn’t come away feeling enthusiastic about the prospects for a stronger economy. The middle class continues to lose ground in America and abroad, feeling disenfranchised and very concerned for their future. This same atmosphere led to the rise of the populist movement towards de-globalization that resulted in Brexit, the United Kingdom exiting the European Union. We can’t afford another lost decade in our markets due to lax oversight of Wall Street, misaligned corporate interests, and a dysfunctional government. Unless American leadership get it's act together, we could be headed for a prolonged period of economic secular stagnation. In simple terms, we need real growth spurred by business investment from the private sector and smart fiscal policy. It’s the only way to increase economic growth, create jobs, raise wages, and promote the American Dream for all. Sources: The Wall Street Journal Online; Bloomberg News; Forbes.com; The Economist.com; CNBC News; CNN Money.com. Brexit Wins: A vote that changes everything … or does it? Contrary to what many establishment elites assumed, The United Kingdom voted to leave the European Union in a historic vote on Thursday, June 23. Heading into last Wednesday, the polls were running about even for staying (Bremain) and leaving (Brexit). The final voting tally was 52 percent to 48 percent, and the out-of-touch “establishment elites" are stupefied by the referendum by British voters to leave the E.U. Markets reacted in dramatic fashion as many investors were caught wrong-footed by the Brexit win, and by the closing bell on Friday, the Dow Jones Industrials had lost over 600 points. The S & P just dropped below its 200-day moving average as of the writing of this piece at 10:15 a.m., Monday, June 27 - an ominous trading sign. Safe haven assets, such as gold and U.S. Treasuries have rallied in typical response to a perceived negative market event. This is not a 2008-type crisis. We could be heading for a prolonged period of ambiguity as markets sort through the U.K.’s “divorce details” from Europe. We could experience continued bouts of volatility in the weeks ahead, particularly in currency markets. The tip of the iceberg? The Brexit trend could have a “domino effect” elsewhere in the world. Voters everywhere have grown increasingly disenchanted with the outcomes of globalization over the past 25 years. Note: next year, France and Germany head to the polls. If "de-globalization" sentiment continues to build, the effects could be significant for the future of the European Union and elsewhere. Politically, it’s not over: The U.K. government is in turmoil as Prime Minister Cameron has announced his resignation effective in October. It will be up to the new PM to trigger Article 50 of the Lisbon Treaty and begin the two-year process of negotiating the U.K.’s exit from the EU and new trade deals. There has been a growing populist political movement in the U.K. (as well as in the U.S.), fueled by British middle-class concern over their future due to lax immigration rules and an open-border policy between EU members. The rise of ISIS and recent horrific terrorist attacks have served to fuel voter angst. The Brits evidently have had “enough of experts.” Globalization didn’t work out as well as promised; middle-class citizens have watched their wages remain stagnant for decades. As mentioned above, Prime Minister Cameron, who backed the “Bremain Camp,” has made it clear that the decision to trigger the U.K. divorce with Europe under Article 50 of the Lisbon treaty is for his successor. Many believe the new prime minister will be Boris Johnson, former mayor of London and a chief “leave campaigner.” The new PM will begin the negotiation of new trade agreements with Europe in October, and it could get contentious. The rest of Europe is none too excited about losing one of EU’s largest members. Between now and October, there is a leadership vacuum that will likely result in continued political turmoil in the U.K. It remains to be seen if the U.K. anti-establishment vote has a “domino effect” elsewhere, particularly here at home in our presidential race. Our equivalent to Boris Johnson, some might say, is Donald Trump. Additionally, given the lack of clarity surrounding Brexit details, business investment spending (capex) is likely to remain on hold, furthering the probability of a recession in the U.K. The Brexit still needs to be approved by the majority of the remaining European Union members in October. Just as with any divorce, there is going to be a period of adjustment as both sides work out their differences. The U.K. is one of the largest economies in the world, and London is a key global financial center. As such, investors are understandably concerned. However, I believe expert economists who are promulgating dire global market consequences from the Brexit are simply wrong. Keep in mind, the European continent has been in a prolonged recession since the U.S. triggered a financial crisis in 2008, with the U.K. being in the best financial shape of the group. While the Brexit hurts European growth in the near term, the U.K. could benefit from better re-negotiated trade deals. A cheaper pound will certainly help U.K. exporters in global trade, offsetting some of the economic damage from the Brexit. The Pound is getting "pounded" by markets, hitting a 20-year low against the dollar. Markets will continue to be choppy as Brexit angst weighs on investor sentiment. Many banks and money managers will be forced to liquidate holdings to meet redemptions and reduce risk. However, this does not appear to be an '08 - caliber panic event. Central banks have made it clear that they stand ready to intervene and provide liquidity to markets. It’s now likely that the Bank of England will cut rates in July and rate changes by our Fed will remain on hold until after the November elections. From a credit perspective, the ratings agencies have announced that the UK’s sovereign debt will be downgraded as a result of the decision to breakup with Europe. And downgrades could widen credit spreads. During market corrections, it’s important to remain calm and keep in mind that investment opportunities are borne out of market uncertainty and panic. A post-Brexit backdrop will create some fallout in markets along with inefficiencies, creating opportunity in high-quality U.K. equities, bonds and other global asset classes. U.K. businesses have been hit hard here, and some of the impacts of the Brexit vote may already be reflected in prices. This is the type of environment where "best-in-class" long-term asset managers would be expected to add value by seeking out undervalued assets. At Cambridge Wealth Management, we will continue to look for opportunities where assets have become attractively priced due to market dislocation. However, we’re not rushing to purchase any assets, as we remain mindful of the challenges in the near–term. Public sentiment and geopolitics are ever shifting, but great leaders and businesses always seem to find a way to adapt quickly and prosper! Sources: The Wall Street Journal Online; Bloomberg News; Financial Times; Forbes.com; The Economist.com; MFS research; Fidelity research; CNBCNews.com. Observations and views expressed herein may be changed at any time without notice and should not be construed as investment advice or to predict future performance. It is not an offer, recommendation or solicitation to buy or sell. It is based on information generally available to the public from sources believed to be reliable. Changes to assumptions may have a material impact on any returns detailed. Past performance is not an indication of future returns. Please consult your financial professional before making an investment decision. Outlook 2016: Correction or crisis? The choppy trading in global stock markets has set the tone for a turbulent year ahead. Since the start of 2016, investors have pulled about a billion dollars daily out of equity mutual funds through Friday, January 15. The beneficiary of these equity sales has been the natural safe haven: cash and U.S. Treasury bonds. With markets off to their worst start since 1927, investors are nervous. And unlike last August, it doesn’t appear this market is going to bounce back anytime soon. The panicky price action has brought the market bears out in full force. On Friday, the Dow Jones Industrials lost another 391 points, oil traded below $30 for the first time in 12 years, and Europe officially entered bear market territory (20% decline from a prior market high). So what’s causing this dramatic reduction in investors’ appetite for risk? However, unlike five months ago, when it seemed the global economy was picking up momentum, investors are beginning to think that perhaps there is a fundamental deterioration in global growth. This fear of a recession is fueling a selling stampede in global markets. We think, barring seismic-type events stemming from a sudden devaluation of the Chinese currency, further deterioration in credit spreads, or tensions in the Middle East flaring up, the probability that the U.S. economy slips back into recession remains relatively low. As this juncture, it’s important to outline some key data points to help put the current market turmoil in perspective. To begin with, market pullbacks in the 10% range are not uncommon and are healthy for markets. In fact, we should experience about one per year. However, until last August, we had not experienced a market correction of 10% since 2011, and we thus had grown accustomed to low volatility in markets (thanks to our Fed’s accommodative zero interest rate posture (ZIRP). Last August, when the Chicago Board Options Exchange Volatility Index (VIX), a measure of investor fear, spiked to 50, we mentioned in "China's currency reset is a game changer" that such events tend to cluster -- experiencing a few back-to-back market pullbacks, after such low volatility, should be expected. The VIX recently spiked again and touched 30.95 on Friday. Cautionary note: the chart below illustrates the market uptrend that began during the European debt crisis in 2011 has been broken. It appears the neckline of a large head and shoulders top (technical analysis jargon) is forming, signaling the reversal of a prior bullish trend. The Chinese economy is undergoing a massive transition, from an export-led economy to a consumer-led economy. This means lower rates of growth but just how low remains the big question for markets. The market consensus is hoping for about 6.5% GDP growth rate in 2016, down from about 7% in 2015 (we may never really know the actual numbers). Adding to investor’s concerns, Chinese regulators continue to fumble the ball when dealing with its market regulations. It now seems that Chinese policymakers are struggling to find the proper tools to help engineer an economic “soft landing”in their slowing economy. If growth rates come in lower than 6% for China's economy in 2016, it could trigger further Yuan devaluation by the PBoC to lift its economy. Yuan devaluation exports deflation globally, and it would likely trigger a new round of global currency wars by Central Banks. China shocked markets when it suddenly devalued its Yuan in August 2015, and central bank officials have been struggling since to make sense of China's intentions. As the dollar has strengthened, it has become increasingly costly for the Peoples Bank of China (PBoC) to maintain the Yuan's peg to the dollar. It's estimated that China has lost more than 700 billion in foreign-exchange reserves (currently about 3.3 trillion) since mid-2014 by maintaining its currency link to the U.S. dollar. The free fall in crude oil prices has continued to unsettle commodity, stock, and corporate bond markets. Oil prices dipped below $30 on Friday and West Texas crude prices have fallen nearly 20% year-to-date. The current situation appears to be overwhelmingly supply-based and dollar-related. And with sanctions on Iran lifted, there is more oil coming to market. At some point, there will be a balanced market clearing level, perhaps as soon as the second half of this year. Currently, the plummet in oil prices below $30 a barrel is causing a lot of distress in the energy sector, and banks are preparing for the worst by putting aside extra loan loss reserves. According to a recent Standard & Poor’s report, 50 percent of energy junk bonds are now distressed, meaning they are at risk of default. Distress in the oil patch could reduce S & P earnings by 7 - 8% in 2016. Last, on one hand, the fallout in oil prices can be viewed as a positive for global consumers; on the other, it could lead to geopolitical risks. Commodity exporting countries have seen their currencies continue their year-long decline against our dollar in 2016. The Brazilian real has plunged about 36% against the dollar over the past year. Manufacturing indexes have fallen recently, bordering on contraction, but this has occurred before in mid-cycle ‘soft patches’. Keep in mind, the modern U.S. economy is dominated by services — which have held up to date much better than expected. While recessions are never ruled out as a possibility at any time, key signals continue to show a low probability of a U.S. recession, such as healthy consumer and steady, albeit slow GDP growth. What can you do to protect your portfolio? Data and sentiment change daily. With so many new market variables at work, it’s important to maintain a clear, calm, and longer-term perspective. It's of particular importance to embrace a disciplined process to guide investment decision-making during challenging periods of heightened volatility. Our disciplined investment approach actively uses a set of principles that grows and protects your wealth as we guide you through the ups and downs of the stock market. It's also important to keep in mind that markets provide a benchmark for asset valuation. According to a FactSet Earnings Insight report 9.4.15 cited in our market viewpoint entitled "Is this the end of the Goldilocks Economy? ", the S&P 500 consensus earnings estimate stood at $128 per share for 2015. Earnings for the S&P 500 came in at about $120 per share in 2015, roughly the same as 2014, resulting in a flat year for the market in 2015. For 2016, the S&P 500 Index consensus forward 12-month EPS estimate is $125.48. In our view, market valuations now look pricey at a time when our Fed has begun raising interest rates, global trade is slowing, and corporate profit margins appear to be peaking. Also, the ongoing Chinese yuan depreciation presents significant deflationary/market risks as other countries may be forced to devalue to remain competitive. Given our outlook for 2016, we maintain our underweight position in equities and overweight cash/credit-related assets relative to our asset allocation model benchmarks. At this market juncture, it's prudent to have above average cash on hand for future undervalued investment opportunities. We remain vigilant as the current market uncertainty presents an opportunity to identify mispriced assets due to disparities between fundamentals and capricious investor sentiment. Sources: The Wall Street Journal; Bloomberg News; Financial Times; Investors Business Daily; Forbes.com; CNBC.com; The Economist. Is this the end of the goldilocks economy? The extreme volatility that we witnessed in recent weeks continued to recede heading into last week’s Federal Reserve Bank Open Market Committee (FOMC) meeting. 1 I believe that as we slowly transition out of this “Goldilocks economy”, and the Fed begins raising interest rates, market volatility could remain at elevated levels. The market initially breathed a sigh of relief as the Fed maintained its accommodative policy on Thursday. According to FactSet's September 4 report, “The second quarter of 2015 marks the first time the index has seen two consecutive quarters of year-over-year revenue declines since Q2 2009 and Q3 2009. It also marks the largest year-over-year decline in revenues since Q3 2009 (-11.5%).”2 The report mentioned that only six sectors were reporting increases in revenue, led by healthcare. The chart below illustrates the return of the S & P 500 after the last four Fed rate hike cycles. In most cases, equities struggled after the first hike, only to recover and outperform in the ensuing year following the first rate increase. Click here for a quick lesson from Investopedia on, "How interest rates affect the stock market." Source: Morningstar and FPS, Inc. The markets have become addicted to QE and a zero interest rate policy (ZIRP). Getting rid of it will involve some withdrawal pain. According to a Congressional Budget Office (CBO) report released in January of this year, once the Fed begins raising rates, the 10-year Treasury note will begin rebounding to its historic norm and reach 4.6% by 2025. This return to normalization will raise our national debt payments from $227 billion a year in 2015 (1.3% of GDP) to over $820 billion by 2025 (3.0% of GDP, the highest ratio since 1996).3 So, one can imagine why the markets are obsessing over successive rate hikes. Future costs of servicing our national debt due to higher interest rates could present a real drag on GDP. The Fed's accommodative ZIRP has been a key driver behind the bull market we have enjoyed over the past several years. It’s not the first rate hike that's concerning the market, as it’s been talked about more than just about any other financial topic over the past few years. It's the speed and severity of successive hikes — markets want a slow and steady path back to normalized rates. Our view remains that it could take longer than expected for Treasury yields to normalize because of slow economic growth, low inflation, and robust demand for our 10-year and 30-year Treasury debt from home and abroad. 2. Fact Set Earnings Insight, September 4, 2015. 3. Congressional Budget Office Report, "The Budget and Economic Outlook: 2015-2015" January 2015. Observations and views expressed herein may be changed at any time without notice and are not intended as investment advice or to predict future performance. It is not an offer, recommendation or solicitation to buy or sell, nor is it an official confirmation of terms. It is based on information generally available to the public from sources believed to be reliable. Changes to assumptions may have a material impact on any returns detailed. Past performance is not an indication of future returns. Price and availability are subject to change without notice. Consult your financial professional before making an investment decision. Additional information is available upon request. The start of the second quarter was greeted by a surprisingly weak employment report on Good Friday. The market bears came out of hibernation and immediately began growling for a market correction after March non-farm payrolls showed an increase of only 126,000 jobs vs. Reuters' expectations of 245,000. After a brief sell-off at the opening bell on Monday, the market has rallied back, and it continues to "climb the wall of worry". • Europe has essentially been in a depression since the financial crisis of 2008. The dollar has appreciated about 20% against the Euro since June 2014 as the European Central Bank began its own Quantitative Easing (QE) last June to spur growth and stave off deflation. QE is buying bonds with money printed by the central banks in order to push down long-term interest rates and encourage investment. The Bank of Japan was the first to engage in QE about 14 years ago, and it's resulted in a period of secular economic stagnation for Japan (perhaps an understatement). Our Federal Reserve Bank began its QE policy in 2008 with QE 1, and then QE 2 and a QE 3 in June 2011 (Europe, as you may recall, was on the verge of disaster). Since then, the Fed has added over 4 trillion of US bonds/debt to its balance sheet, and we've continued to ignore the market mavens and former colleagues call to sell high coupon bonds. Instead, we've bought any spikes in yields for retiree and trust accounts, most recently in December of 2013 when the 10-year Treasury yield approached 3%. • The dollar’s strength has caught many investors by surprise and has led to a precipitous drop in the price of oil from about $99 in June 2014 to current levels around $51. At CWM, we think the strong dollar is a sign of continued strength in the US and not just a flight to quality. • US Treasuries have rallied the past year, particularly the long end. The 10-year Treasury is still below 2.00%. The US 10-yr @ 1.91% vs. Germany's equivalent @ .016% and Japan's equivalent @.365% as of this writing. 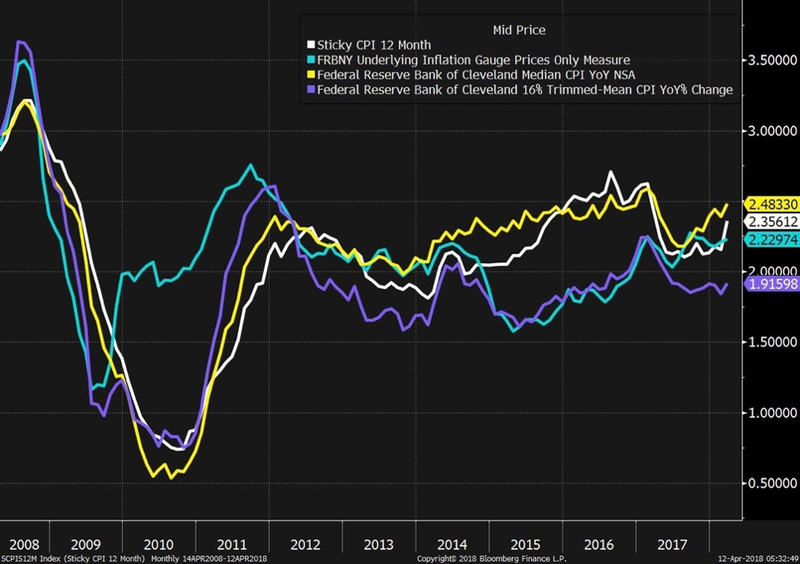 Chief Economist of Gluskin Sheff, David Rosenberg, thinks the stronger dollar is already acting as a tightening mechanism (higher interest rates) as US corporate profits have begun to get squeezed. He states, “The Fed would be well advised to sit back, watch, and assess--- and let the dollar do the heavy lifting.” Corporate America, according to some estimates, lost over 18 billion in Q4 2014 due to the stronger dollar. The market is an efficient pricing mechanism, and we think it has adequately priced in the effects of a stronger dollar on corporate earnings going forward. In his April Market Insights, Rich Bernstein (a market bull) of Richard Bernstein Advisors begins by stating “Beauty is in the eye of the beholder – the same can be said for equity valuations”. His conclusion based on his quantitative work: “the market is valued as it would typically be for a mid-cycle period, roughly fairly valued”. This bull market is one that many market pros seem to hate--market pullbacks of 5 - 8% are healthy. Once the Fed makes its move, perhaps later this year, we think the markets will act more decisively. We suspect that liquidity will not be shut off by Central Banks in the form of significant tightening this year. • We're overweight growth vs. value. We expect the US market to move sideways as earnings estimates are too high. German and Japanese markets may play some catch-up. • In Q1, we closed out our tactical overweight in TLT, (20+ yr. US Treasury Bond ETF). Its outperformance surprised us as we merely saw value in the long-end of the yield curve. The return in TLT was accentuated by QE in Europe -- it moved from 101.72 on 01.02.14 to over 131 on 01.06.15. • We have shortened bond maturities and duration for the first time in nearly a decade. However, we think the move higher in interest rates will be gradual—do not fret. GDP growth is still anemic compared to prior recoveries and as such, the market has become addicted to QE. There is too much capital, however, chasing too little value in bonds, especially short duration bond funds ( i.e. asset bubble). • We have a tactical overweight in Germany and Japan and expect these markets to outperform the US in 2015 given the dollar strength. The strong dollar favors strong manufacturing, exporting countries such as Germany and Japan. • Cheap energy stocks/drillers do not represent value in our opinion. Value is determined by cash flow and assets, and both are at risk in this sector. We leave it up to the best-in-class private equity and hedge fund managers to determine what represents good value in this sector. We sold our remaining energy MLP in early January 2014 given the inverse relationship between a strong dollar and oil/gas prices. • We think writing covered calls at the upper end of the current trading ranges is a prudent strategy in a range-bound market---enhancing total return with income from premiums while lowering cost basis and volatility. • We continue to favor technology, particularly medical technology, and healthcare at this juncture. The larger question on our minds is can central banks usher in a new era of economic stability marked by low rates, modest growth, and stable inflation? Only time will tell the economic implications of this great monetary experiment called QE. Like Japan, we could be headed for a prolonged period of secular economic stagnation. Our Federal Reserve Bank Chairman, Janet Yellen, recently voiced such a concern. Much of the excess capital created by our Federal Reserve Bank QE policy has yet to find its way back to Main Street USA in the form of job-producing growth and capital goods expenditures. We think, however, Good Friday's employment report is just another lumpy employment number and not a harbinger of a weakening economy. At this market juncture, it’s time for the consumer to grab the baton it’s being handed and finish the last leg of this economic recovery with strength. Past performance may not be indicative of future results. Different types of investments involve varying degrees of risk. Therefore, it should not be assumed that future performance of any specific investment or investment strategy (including the investments and/or investment strategies recommended or undertaken by Cambridge Wealth Management, LLC) will be profitable or equal the corresponding indicated performance level(s).